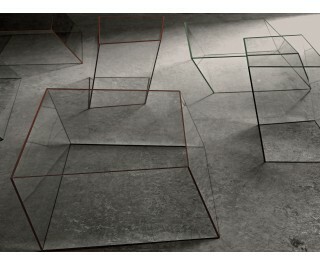 A series of twisted and irregular, parallelepiped shaped low tables, obtained by gluing tempered transparent extralight glass slabs, whose edges have grinding angles with each of their inclinations completely different from the other ones. The result is an apparently unstable and precariously balanced low table. The edges are enhanced by a green, orange, black or white coloured line.